OpenGov had the privilege to learn in-depth about the EGA through Dr. Sak Segkhoonthod in this two part interview series. In Part I, we learn about the origins, strategies and developments of the EGA. In Part II, we will look at the role of EGA in the Smart Thailand initiative as well as the challenges ahead for the EGA. Tell us more about your role as CEO of the EGA. Before I tell you about my roles as the CEO of the EGA, let me begin by telling you briefly about the digital government transformation in general and in Thailand in particular. As you may have already known we are already in the digital era, in which digital technologies profoundly transform our lives and the operations of governments around the world. Numerous governments around the world recognise the significance of digital technologies for transforming government operations. The approach to digital government transformation which more and more governments including the Royal Thai Government adopt is the sharing and integration of digital resources. It means the government sets up a new organisation like the EGA to provide digital infrastructure for other government agencies to achieve economies of scale and enhance efficiency in spending taxpayers’ money. Moreover, central organisations such as the EGA are also entitled to develop digital standards and guidelines and to provide training for government personnel. So my roles as the CEO of the EGA needs to be considered and explained in this context. In order to achieve the missions, the EGA sets out three strategies: sharing, delivery and transformation. For sharing, we try to integrate digital government infrastructure such as the secure and reliable network, Government Cloud and Government Software as a Service (G-SaaS) to enhance government’s efficiency in digital infrastructure investment. For delivery, we focus our effort to enhance the quality of delivering government services to people, for example, we provide Government API Service, which is a tool to enable government agencies to share and exchange data between one another effectively and to serve people better. We also launched the Government Access Channel or commonly known as GovChannel which enable people to connect with the government more easily. For transformation, we need to devise digital standards and guidelines, and equip government personnel with digital skills and mindsets. My most important role as the CEO of the EGA is to lead the organisation and mobilise resources to implement the three strategies for the benefits of Thai people. The other point which is worth mentioning here is that the EGA was established in 2011 as a public organisation with an aim to provide shared digital infrastructure such as the Government Information Network or GIN, Government Cloud, G-Chat, Government Electronic Email or MailGoThai for all government agencies in Thailand. We need to convince them to realise the benefits of using our shared infrastructure in terms of efficiency, redundancy reduction and technical support. Moreover, in order to complete the projects assigned by the Government, the EGA needs to collaborate with all government agencies for the benefits of our people. Within the context I have explained, my role as the CEO of the EGA is not only confined to providing a clear strategic direction for my staff and the Government about digital government transformation in Thailand as I mentioned earlier, I also have to represent the EGA in talking to the Government and the heads of government agencies in order to build trust and strong relationships with them. It lays a strong foundation for further co-operation in digital projects. Educating people and stakeholders about digital technologies is also of great significance. I have continuously given lectures to different groups of audience from public officers on a wide range of topics related to digital technologies and digital government. It is necessary for me to increase the awareness of Thai people and government officials of the changes they have to face in the digital era and how digital technologies can be optimized to make their lives and their operations more efficient. Last but not least, leading by example is much more effective. As the CEO of the agency responsible for digital government transformation, it is my duty to be a good exemplar by using digital technologies as much as possible, for example, I always communicate with my staff via my official e-mail account or G-Chat. I strongly believe that this will inspire my staff to transform the way they work. What are some of the major initiatives/projectives that you are working on at your organization now? First, with regard to plans and standards, we devise the new comprehensive “Thailand Digital Government Development Plan 2017-2021” covering 26 government capacities in five strategies with close cooperation from many government agencies in Thailand. 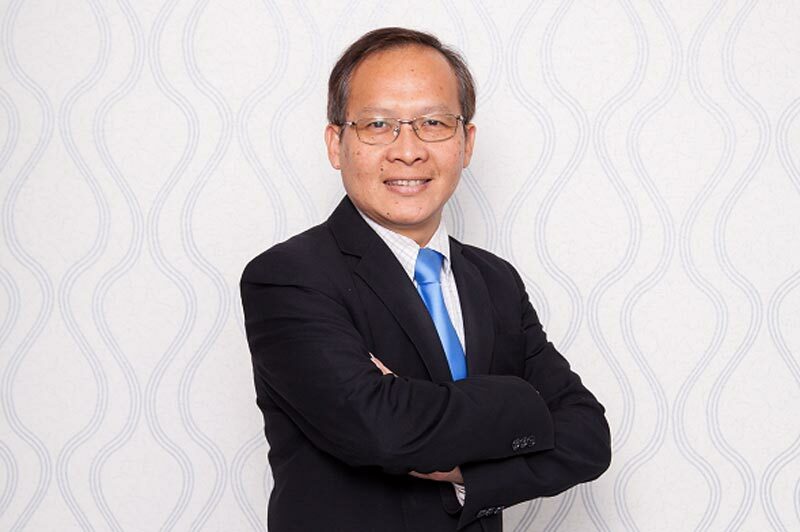 According to the plan, the five strategies to achieve Thailand’s digital government goals are: (1) Quality of Life Enhancement; (2) Business Competitiveness Improvement; (3) Public Stability and Security Reinforcement; (4) Government Efficiency Promotion; and (5) Government Digital Infrastructure Integration and Building. This plan is a product of active participation by a large number of significant stakeholders, especially relevant government agencies which share the digital government vision with us. We will propose the plan to the Cabinet for approval as soon as possible. After that it will become the major framework with concrete measures, projects and time frames for digital government transformation in Thailand. Another plan we have drafted is the Digital Service Standard. We are still working co-operatively with some government agencies to launch the pilot projects to create or transform their digital services to be simpler and clearer for people. The projects will be success stories and help inspire other government agencies to follow. Second, in terms of services related to digital government transformation, apart from common digital infrastructure, tools and platforms such as the Government Information Network (GIN), Government Cloud, Government API Service, G-Chat and the Centralized Electronic Mail System for Public Sector Communication (MailGoThai) that the EGA has been providing for other government agencies to help them connect or communicate with one another, we also initiate some significant projects which will benefit our people more directly. The first project is Biz Portal which is a part of the Government Access Channel (GovChannel). It facilitates starting businesses through this online channel. Online services on this portal are exemplified by business registration, employer’s registration, work rule submission, requesting electricity and water. The services are provided many agencies such as the Social Security Office, the Department of Labour Protection and Welfare, the Department of Business Development, the Metropolitan Waterworks Authority and the Metropolitan Electricity Authority. We are working with more government agencies including the Revenue Department, the Provincial Waterworks Authority, the Provincial Electricity Authority and the TOT Public Company Limited to expand more online services for entrepreneurs. It will be easier for entrepreneurs to start their businesses in Thailand which will enhance our country’s long-term competitiveness. Our second major project is GovSpending, which can be accessed at https://govspending.data.go.th/. It is the central portal website which utilises the primary data on government procurement compiled by the Comptroller General’s Department, Ministry of Finance and revealed on https://www.data.go.th/ and presents it in an easy-to-understand format. It empowers people of all socio-economic statuses to be able to scrutinize how the government spends taxpayers’ money in each fiscal year with only few clicks. In the future, people will be able to track the budget requests of government agencies and how it is actually spent. When they suspect corruption in any project, they can lodge complaints to the Office of Public Sector Anti-Corruption Commission. We also plan to launch a mobile application of the GovSpending so people can have access to the information anywhere anytime. Another significant project is Open Government Data. We try to encourage all government agencies to open their primary data to the general public in a format which can be processed or utilised by electronic or digital machines on the portal website, www.data.go.th. We bring in the community to make use of the data to create innovation for our society. Some of our activities are Open Data Hackathon at both the national and international levels, the Mobile e-Government Award or MEGA, which is an application development contest and the International Open Data Day. As of 30 January 2017, there are 893 datasets from more than a hundred government agencies available on www.data.go.th. We will focus more on high-value datasets for the business sector and civil society organisations. Moreover, the EGA is also planning to provide public APIs to facilitate the utilisation of datasets by the general public, especially application developers. The final aspect of our initiatives is human resource development. What I want to mention here is the Thailand Digital Government Academy (TDGA), which was officially inaugurated by the Prime Minister on 29 July 2016. The academy is the main organisation responsible for training and equip government personnel around the country with essential digital skill sets for the digital government era. We have been working closely with other government agencies for example the Office of the Civil Service Commission (OCSC) and the Thailand Professional Qualification Institute (Public Organization) to determine appropriate digital skill sets for each job family of government personnel. We are also working with educational institutions and international partners such as Chulalongkorn University, the King Mongkut’s University of Technology Thonburi and the International Academy of CIO to design curricula, lessons and training courses for government personnel. We are confident that our initiatives will be able to create an effective and transparent digital government which will benefit our people. Could you share with us the outcomes of EGA’s Four-Year Strategies (2012-2015)? Since the EGA was set up in 2011, I can say we have achieved a lot. For easy understanding, our achievements can be divided based on three strategies: sharing, delivery and transformation. For sharing, the EGA has been committed to building and providing high-quality, secure and reliable digital infrastructure for government agencies in Thailand in order to reduce redundancy and duplication of the expenditure on digital infrastructure. Our core infrastructure is exemplified by the Government Information Network (GIN), Government Cloud (Infrastructure as a Service – IaaS and Software as a Service – SaaS), the Centralized Electronic Mail System for Public Sector Communication (MailGoThai). The number of government agencies which agree to use our shared digital infrastructure is constantly expanding. Let’s take GIN as an example, at the end of fiscal year 2015 (30 September 2015) 3,352 government agencies in Thailand at every level have been connected to this government secure network. Moreover, we also encourage government agencies to utilise GIN to share information with one another to provide common services for Thai people. Some examples of the common services are the Civil Registration System of the Department of Provincial Administration, Ministry of Interior and the Justice Data Exchange Center System (DXC) of the Office of Justice Affairs, Ministry of Justice, which are still in operation today. Another core digital infrastructure that the EGA provides is the Government Cloud (G-Cloud). At the end of fiscal year 2015, there were 750 government systems which were run on Government Cloud. Regarding delivery, the initiative of which we are very proud is the Government Access Channel (GovChannel), which helps connect our people with the government. It was launched on 16 November 2015 and has become the central channel through which people from all walks of life can access government information and services with minimal limitations. There are three different channels for people to access government information and services, namely: the GovChannel Website (govchannel.go.th); Mobile Applications (Government Application Centre – GAC); and other devices such as Government Smart Kiosks and Smart Boxes. Within the GovChannel website, there are six websites which discloses each aspect of government information and services. First, info.go.th compiles manuals of all government agencies for Thai people when they need to make contact with or request licenses from government agencies based on the provisions of the Licensing Facilitation Act B.E. 2558 (2015). Second, data.go.th opens government data in a format which can be processed and by digital machines. We encourage the general public and application developers to create innovations or start new businesses from the open government data on this website. Third, egov.go.th reveals the details of digital services provided by every government agency. Fourth, apps.go.th compiles all mobile applications designed and developed by all government agencies. In fiscal year 2016, we launched two additional websites within GovChannel. Biz Portal, biz.govchannel.go.th, helps facilitate starting new businesses with all necessary information and electronic forms. In the first phase, three significant government agencies integrate their data and services to simplify and facilitate business set up processes in Thailand including the Department of Business Development, Ministry of Commerce, the Social Security Office and the Department of Labor Protection and Welfare from the Ministry of Labor. We are working closely with other government agencies to expand our online services for the business sector. The other website, govspending.data.go.th launched in April 2016, provides data about the projects on which the Thai Government spends taxpayers’ money around the country. It is an obvious example of how the EGA utilises the datasets from the Ministry of Finance opened on www.data.go.th and present them with infographics which are easier for people to understand. We always realise that digital government transformation must not leave anyone behind. This is the reason the EGA decides to roll out Government Smart Kiosks around the country. The target group is people of low-socio economic status who cannot afford to have internet or smart phones. We are planning to expand the installation with more applications so that people can do more transactions on the kiosks with only their ID cards. The outcomes of the two strategies I have mentioned will not be sustainable without the transformation strategy. The EGA is responsible for training government officials to equip them with essential digital skill sets and mindset to work effectively in the digital government era. In fiscal year 2015 alone, we trained 1,585 government officials at both the executive and operational levels. The number of government officials trained by the EGA through various courses was 6,787 altogether. We are still committed to the digital government transformation for the benefits and well-being of Thai people. I strongly believe that with the strong determination from the government and full co-operation from every key actor, especially all government agencies, the digital government transformation in Thailand will definitely be successful. Stay tuned for Part II of the interview next week as Dr. Sak shares more EGA&apos;s role in the Smart Thailand Initiative and challenges ahead for the EGA.